Beautiful Purple Flowers – It’s a purple shade. 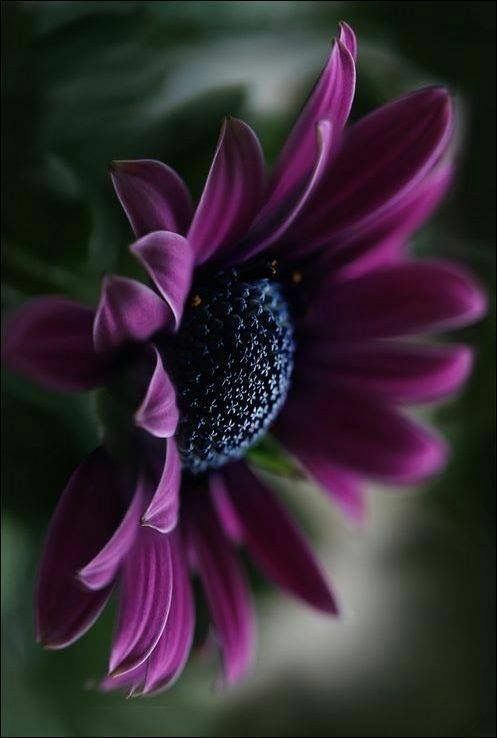 A royal, dignified color; many people do not know that purple flowers are as beautiful as the enchanting red roses. Some even too scared to use the color of purple to decorate their house simply because the color can be too overpowering for any other colors. In fact, purple flowers or violet flowers are the perfect options for a ceremony since it resembles graciousness and royalty. 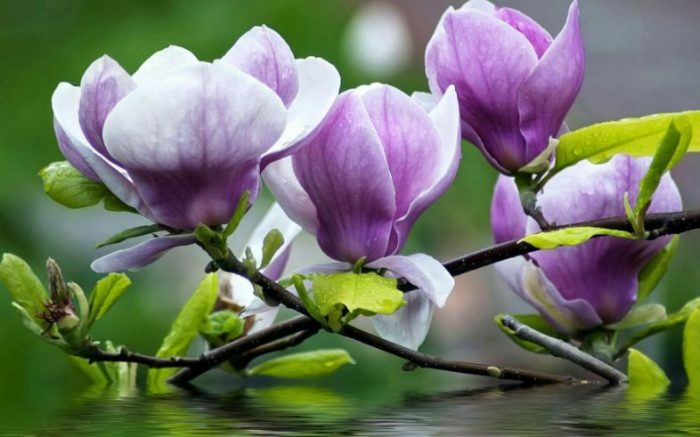 These beautiful purple flowers pictures are ready to decorate your room, wedding or garden with charms. 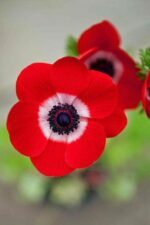 Who does not love this lovely-looking flower? Lavender is the favorite purple plants for anybody. It has the color, the fragrance, and the use you will never fail to think of. Its fragrance, for example, is favored among perfume makers and used in making home remedies for a bugs-related cause. Lavender commonly has light, baby purple color to purplish-blue and dark purple. Although there is also other white and pink lavender, one that has purple shade is the most favorite. 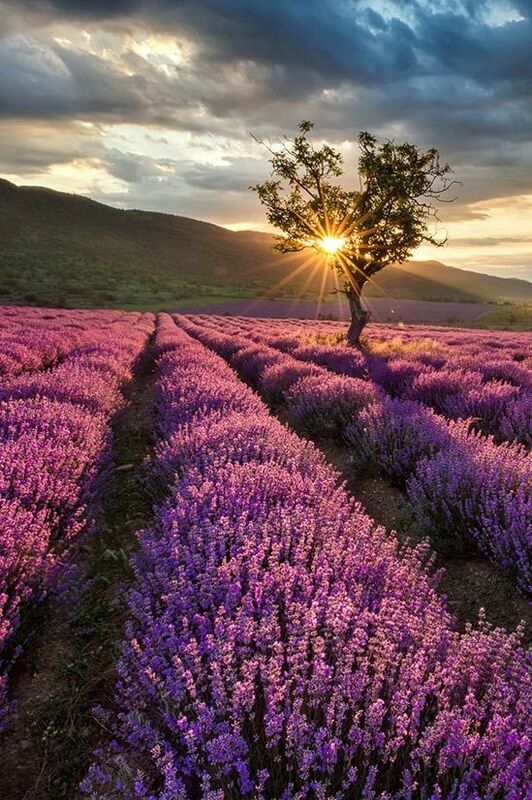 It is said that lavender flower is related to healing quality for our spiritual being. 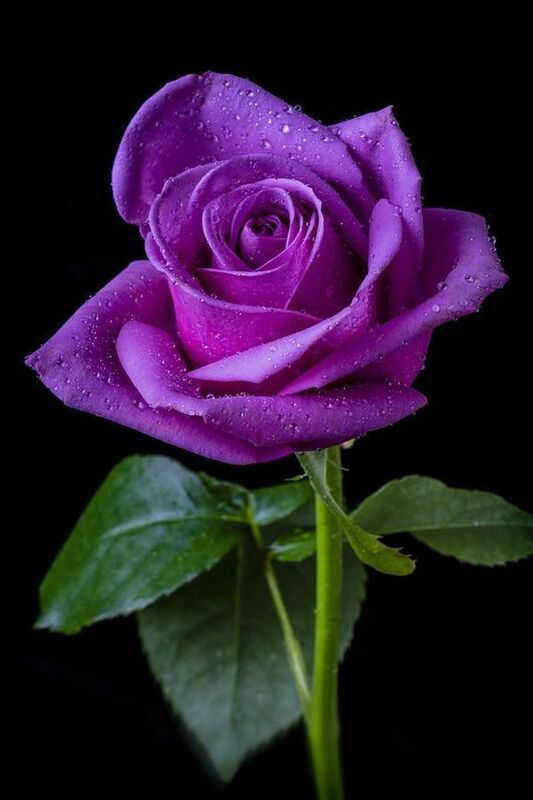 Unlike the bold red roses, purple rose flower signifies love at first sight. If you are getting a bouquet of this, that person is definitely enchanted by you at the first meeting. It has a magical quality that lovers used to send purple rose flowers to their lifelong love on their 25th anniversary. Thanks to its royal and fairy-tale quality, the purple rose flower is never failed to impress its beholder. Purple roses mostly have various hues, from violets to lavender. They come to present many admiration, majesty, magical, and infinite possibilities. If you got a lighter purple rose, it shows real calmness, achievement, and fulfilling your dream. You may only familiar with the white daisy, but there are many types of other beautiful daisies, including the purple daisy. Among any other daisies, purple daisy can grow up to 4 feet tall and is considered as Echinaceas that mostly used in cold remedies. The purple daisy has striking purple petals with yellowish-brown to dark-purple cone-shaped center and deep green leaves. What is so unique about this flower? Just like any other daisies, it can be found is almost anywhere on the earth’s soil except in Antarctica. The purple daisy loves sunlight and water. I think it’s worth the effort of getting out in the late winter to get this beautiful flower. 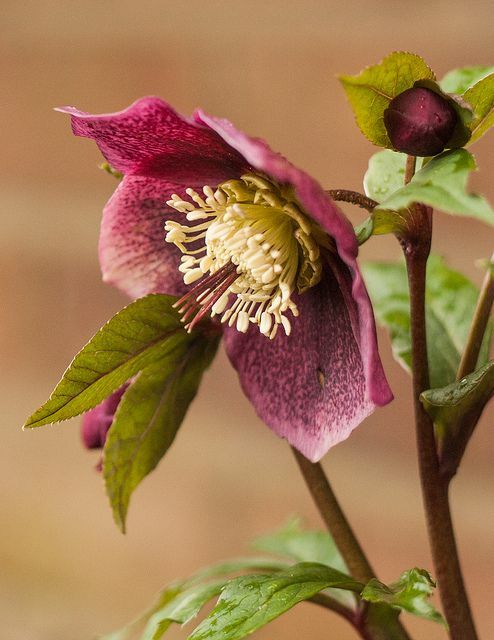 The Oriental Hellebore is a perfect small purple flower to decorate your kitchen with, place on the dining table, or hang it on the wall—it will make everything less dull and dormant. This flower, in particular, is a striking view of winter/spring gardens. And honestly, with its tinge of purple color, who could resist such beauty? 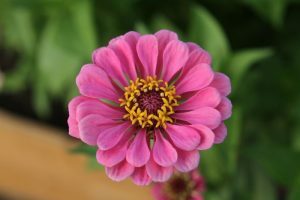 This particular flower is relatively easy to grow, and it’s extremely shade tolerant. Despite its poisonous nature, there is no harm to put a pot of it in a room’s corner—as long as you don’t put it in your mouth. While many recognize fuchsia as a color, it’s actually a name of a flower. 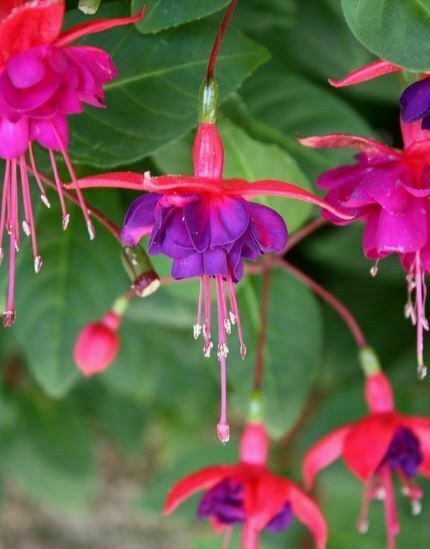 Fuchsia flower has two-tone colors, which are a shade of pink and purple in general. Its small, and unusual shape brings a distinct uniqueness anywhere not just in the garden. It’s a great to grow it in a pot or plant it in hanging baskets on your patio. Fuchsia symbolizes a confiding love. It’s grown all year in tropical countries or throughout summer and autumn in four-season countries. 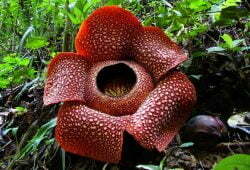 Growing this flower, you need to be extra cautious since it’s susceptible. 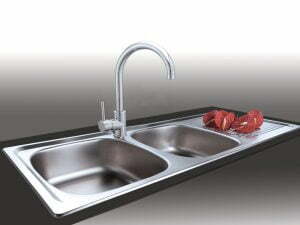 The plant needs adequate drainage and regular fertilization. 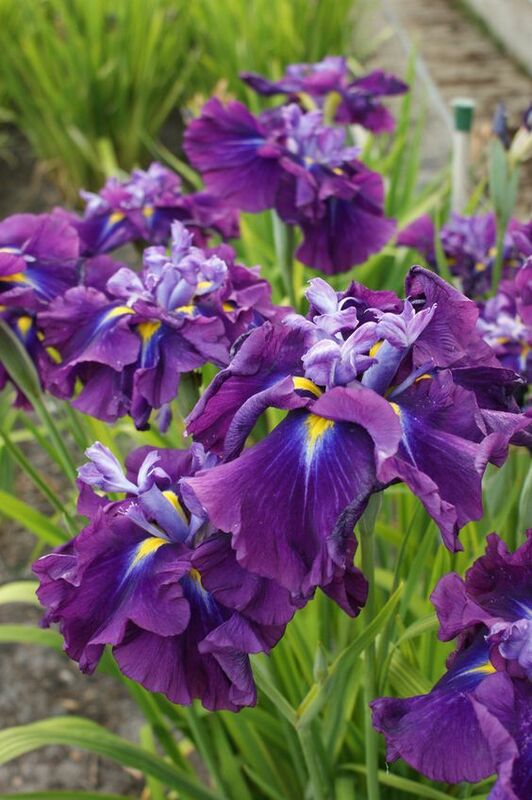 Japanese iris includes three types of purple flowers that grow wildly in Japan. The purple flower blooms in May to July and can be found almost anywhere in Japan. To grow this plant, you will need a lot of the sunshine and well-drained soil. Among the local traditional Japanese community, the Japanese iris symbolizes purity. 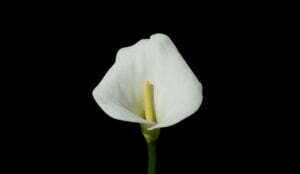 Most people will use the flower to protect themselves against evil energy. It’s not easy to grow these small purple flowers, but it’s definitely worth the effort. 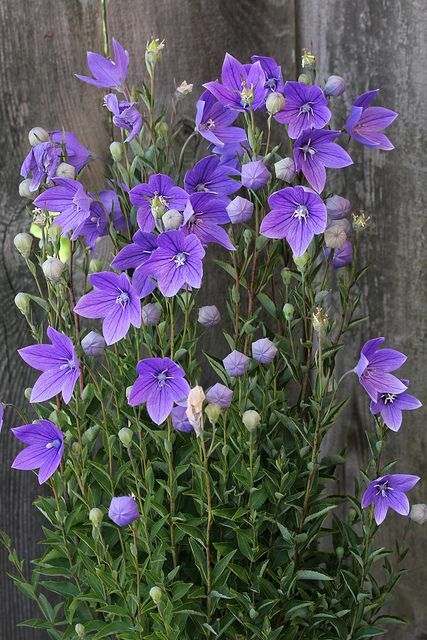 Balloon flowers look beautiful in your garden, and it can grow up to 3.5 feet high during all summer. The blooming does not look like a balloon, rather than it has balloon-like buds that grow into beautiful cup-shaped—if not trumpet-like petals. To grow the plant, you will need part share to full sun and well-drained soil. 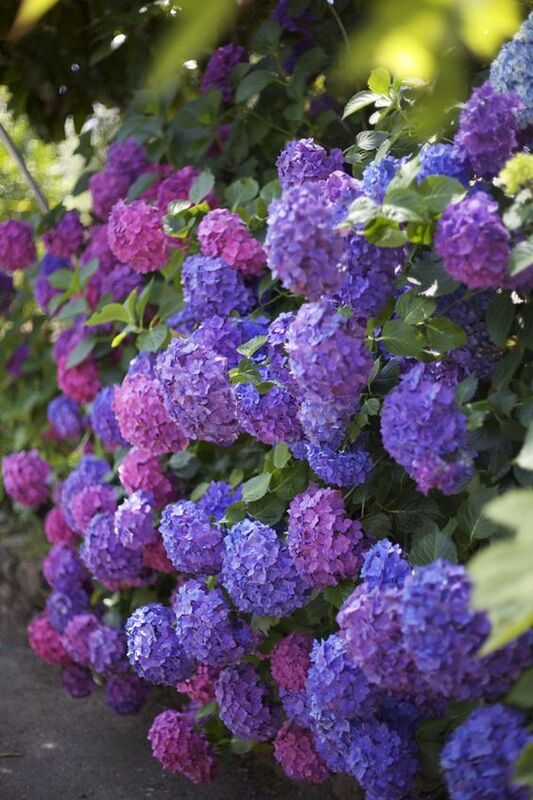 Seeing its appearance, you will find out that hydrangea has the look of a bucket flower. 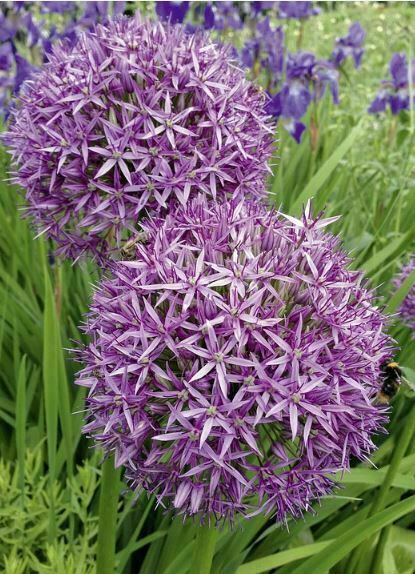 It’s so fluffy and rich and has beautiful soft purple color with star-shaped blooms. In each flower, hydrangea has four to five petals and has both male and female reproductive structures. The plant is more likely grow as a shrub, and it needs full sun to partial shade. Although the flower requires plenty of water, you cannot leave it wet because it will wither. Its beautiful, and ornamental qualities make lilac the best purple perennials for your garden. 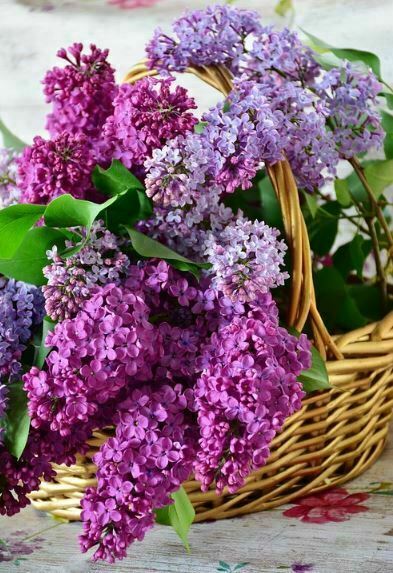 In one stem, lilac can grow long, has hundreds of cultivars in beautiful purple color. 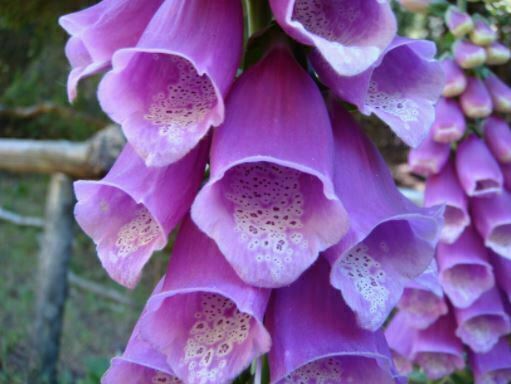 The flower can bloom in mid to late spring and early summer and is highly sunlight tolerant. In the Victorian era, lilac often symbolizes confidence, a reminder of first love, and innocence. To have it fully bloom, let the whole plant receive sunlight and give adequate space between one and another. At a glance, its bulb looks like a clove of shallot. It is not surprising because the plant is still in the onion genus. 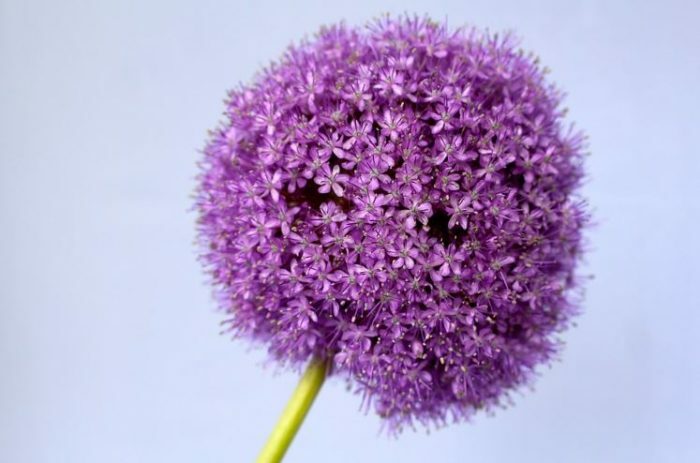 Allium is a minimalist flower—one stem can only have a single bulb, and extremely popular in a home garden. You can sow the seeds in autumn and watch it bloom in spring. As purple perennials, you can place a pot of it in a vase, and it will last from 5 to 10 days at a room temperature. Most people say that its single bulb symbolizes unity, humility, and patience. Wisteria is actually the name of vine trees with long flowers hung on it. In some areas like Japan, the trees are often grown up together in two rows to form something like magical gates. Yes, when the flowers are blossoming, there are only purple shades anywhere and they are just magnificent. 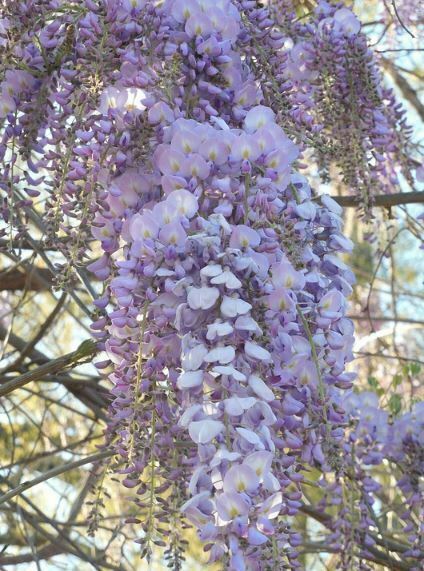 Although the flowers need a long time to blossom, wisteria is considered as a strong tree. More than that, the trees can grow up faster even in bad soil. An ethereal flower, tulip, has a variety of types and colors. Purple tulip is the best way to express your admiration towards the lovely one, and it relates to nobility. A bouquet of purple tulip can also complement the color of your bridesmaids. 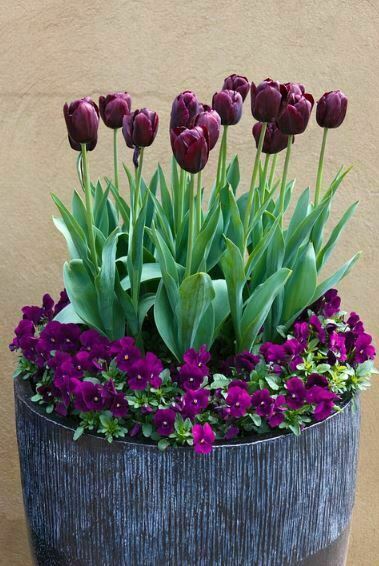 Just like any other tulips, the purple tulip will bloom beautifully in a full sun and fertile soils. If you wish to plant them in your garden, be sure to plant in a group for a stunning visual. To have a perfect bloom in early-mid spring, it’s best to sow the flower in fall. You will mostly find these beautiful small purple flowers in a meadow. 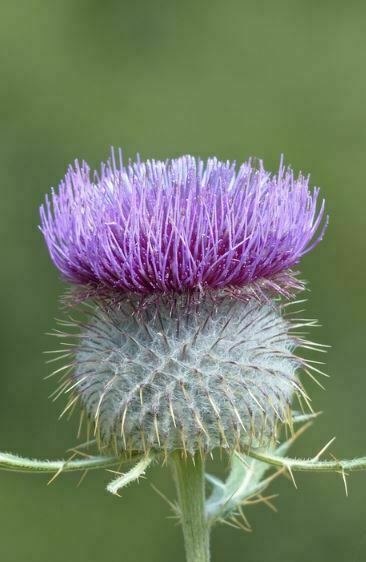 Cirsium is the flower of summer that marks sunny days in a much more beautiful sight. The flower has afro hair-like shape with lance-shaped leaves and hairy stems. During June to August, you will see the beautiful purple perennials growing in the yard, roadside, or gardens. Cirsium needs well-drained, average-dense soil, and full sun. Together, the flower will create an amazing view, but alone, most people call it weed. 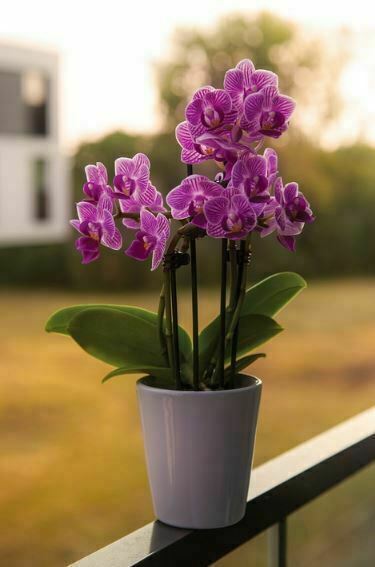 The outstanding purple orchid is a great decoration in your patio or anywhere in the house. It’s a bird friendly, so it’s likely that you’ll find the pot is visited by the animal or other bugs. Orchid is the type of purple flowers that fit the tropical landscape, growing large, and blooming in your yard. To grow the plant, you will need full sun and regular watering, be it weekly or often during the hotter days. In ancient Victoria era, purple orchid symbolizes power and spiritual refinement. This small purple flower is among the few to bloom in early spring. Its tiny and cute shape looks almost like a bulb, except for a prettier color. 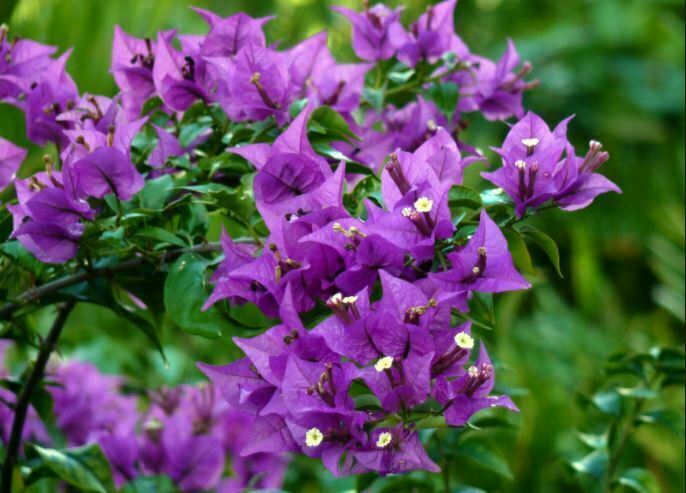 It has rich purple petals that blend well with the golden throat and a sturdy green stem. 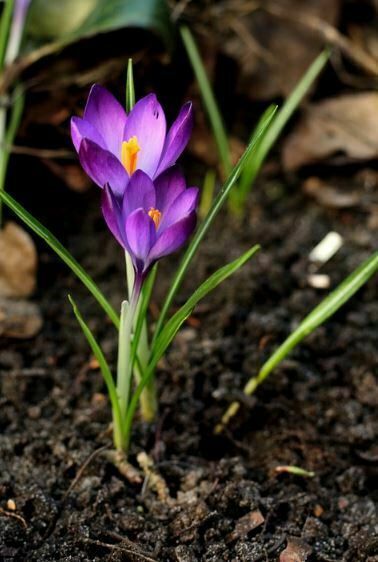 To grow the purple crocus, you will need a well-drained soil and enough sunlight. In ancient myths, purple crocus flower is believed to bring youthfulness and cheerfulness. I think it is right because this flower blooms in spring also signify a new fresh start. 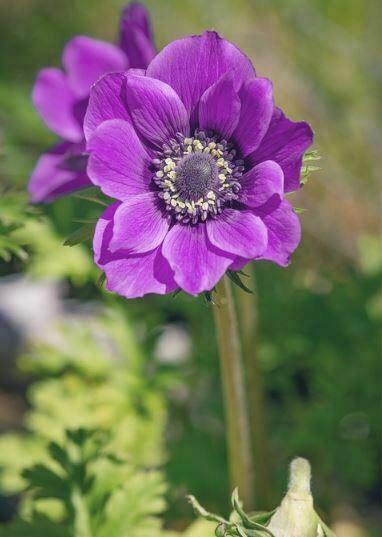 Anemone Flowers – Often called wind flowers, the long-lasting anemones are nice for patio decoration. Although they can multiply on the wet area which is normally cooler, the disturbance from its surrounding can be a serious matter. Highly tolerant to humidity, the bright hues of Azalea will brighten any room environment. 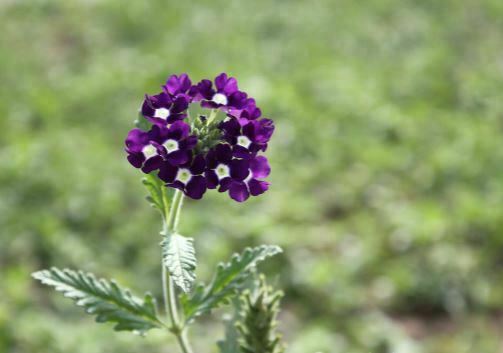 It has five petals with a tinge of purple color that create a perfect balance of the plant. To grow azalea in your garden, you will need good drainage and well acidity level. A small amount of fertilizer will do the rest. However, keep in mind that this perennial has toxic leaves and nectar so be sure to keep it away from children. Its large petals, and bright colors are the best qualities of clematis flower. Not only have that, but its tolerant quality towards exposure and climate also made it easy to grow the purple perennials. 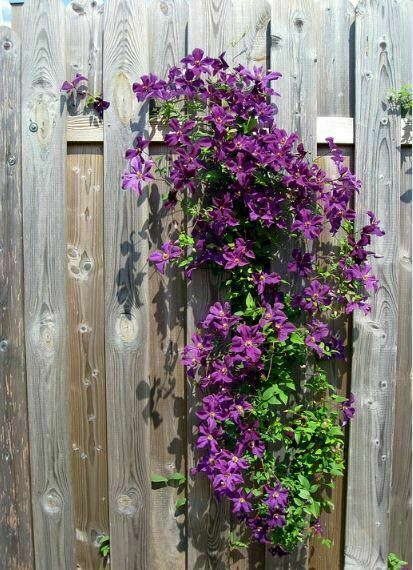 Clematis flowers can bloom in summer, and its hardy stem can reach up to 10 feet long. Growing this plant means you need a well-drained soil with good moisture in full or part shade. Ideally, you should let the root cool or shaded by other plants. 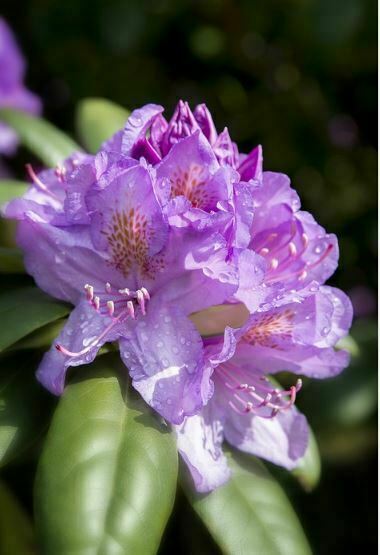 This beautiful purple flower is available in many colors but for majestic vibe, it is surely purple the best answer. 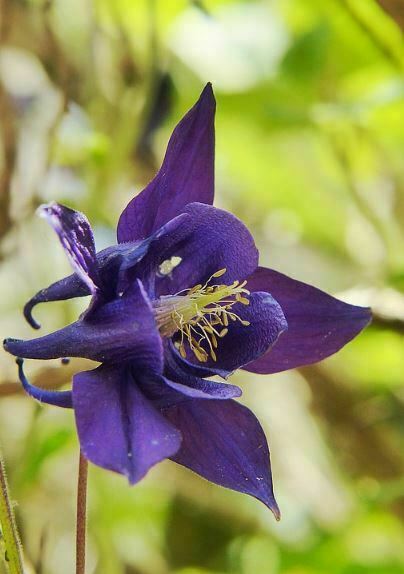 The term Columbine comes from Latin that means dove. Indeed, this flower slightly looks like five doves grouped and they are seen from below. Columbine is recommended for bordering in arrangement. 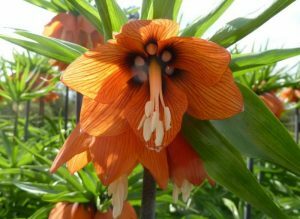 Besides, its unique shape is also not owned by any other flowers. For the germination, it is better to place the seeds on the tray and then they are covered by a plastic with holes for around 3-4 years. Rich in spiritual healing quality, Verbena flowers can grow up to 1.5 feet high in summer and fall. Many people using this purple plant as their talisman to repent evil and physical damage. The flower also represents creativity, expression of love, and well wishes. Most verbenas can grow with little water and considered very drought-tolerant. Just like any other upright-growth perennials, Verbena will create a lovely sight in your garden. 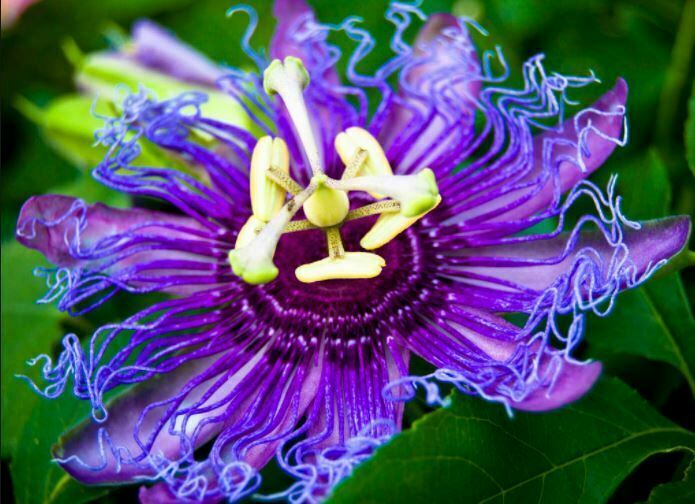 Passion flowers are purple perennials that widely grow in tropical countries such as Brazil and Argentina. When fully bloom, this plant will show beautiful five petals with outgrowing thread like membranes that form a striking corona. From a medical point of view, passion flowers are mostly used to treat sleeping disorder, anxiety, seizures, and treat high blood pressure. Anthurium may be more well-known for its magnificent leaves. However, once the flower is blossoming, it definitely steals the attention. 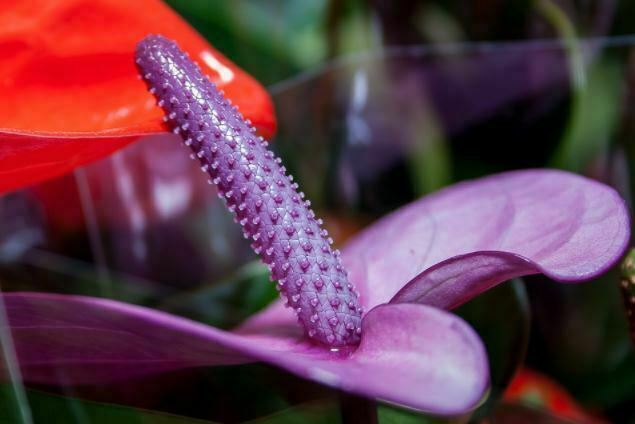 There is a nickname for the purple anthurium flower; it is the flower of cheer or happiness. The combination of unique shape and beautiful color becomes the main reason why people love to call it like that. another good thing about purple Anthurium is that the flower is so human-friendly because there is no thorn on its branches. As wild flowers, Bellflowers are definitely astonishing. It is about the purple sparks spreading on the green bushy leaves. It is so good to plant it when having a quite large front or backyard. Meanwhile, it can also be grown up indoor with some certain techniques. One of them is by keeping giving enough fertilizer and water. For indoor placement, it is still important to sometimes place it outside so that the flowers find enough sunshine. Bellflowers can even survive in the winter. Of course, it will be so soothing to see the strikes of purple over the white snow on the land. 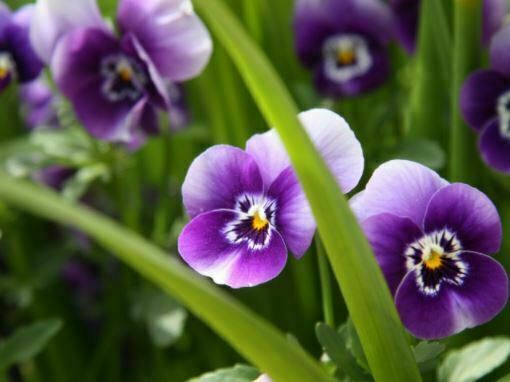 This is another adorable purple flowers can be seen easily in our daily life. The flowers blossom and grow up in groups surrounded by the green leaves. Surely, it is such an interesting thing to see. The texture of its crown is like a paper, it’s quite fragile, the crowns can be easily fallen down when there is a little harder wind blowing around. 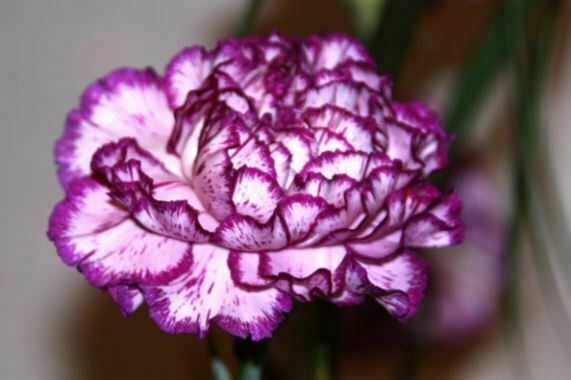 Due to its easy-care quality, carnations are widely used in many arrangements. 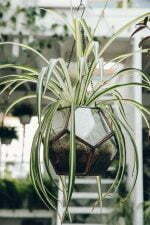 The plant likes moist soil and adequate sunlight, but it can survive without water for as long as two days. A single carnation has five petals blooming on a tall and firm stem. The Aztecs used its useful characteristics in treating headache and dizziness. Despite its dangerous and poisonous reputation, trumpet flowers are ridiculously gorgeous. 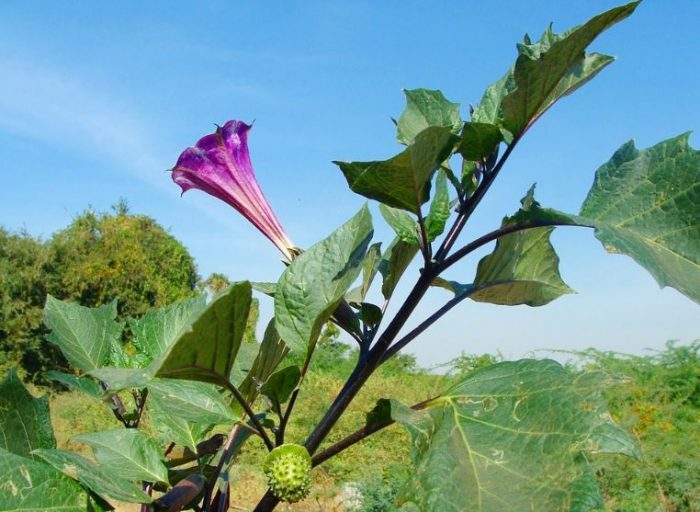 Datura flower can grow best on well-drained soil with filtered to full sun and need regular watering. The unique color of Datura is tricky because all parts of the plants are poisonous. Also known as the Devil’s Trumpet, it’s best to keep Datura flowers in sight but out of your reach. Gladiolus is known as a one-season flower classified in the family of Iridaceae. Originally, the name is from Latin ‘Gladius’ which means the small sword. It refers to the leaves that indeed slightly look like swords in tiny sizes. Meanwhile, the flowers are so beautiful with shapes quite similar to butterfly with some additional slim wings. 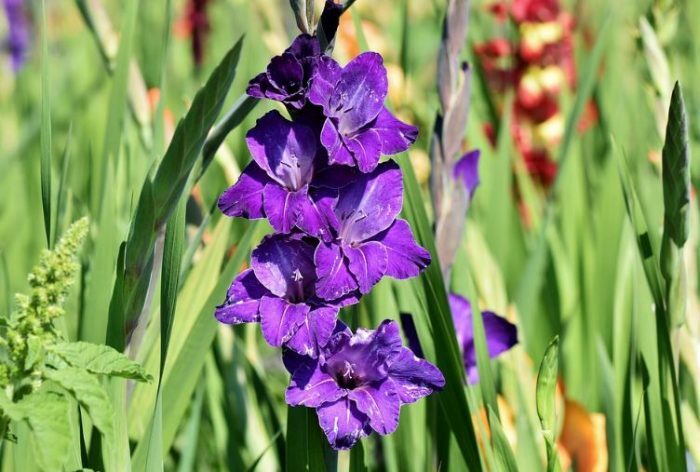 Purple gladiolus is probably not as many as other variations like red or yellow flowers. 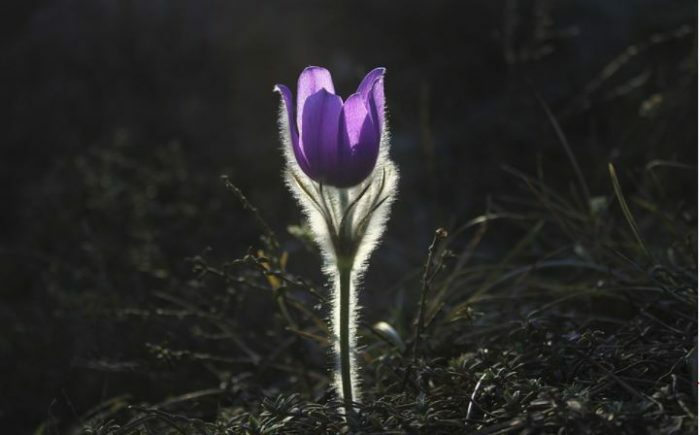 Judging from where you can find it, pasque flower is a wild low-growing perennial, mostly found in the tundra. Gaining its name as a wild plant, this particular flower doesn’t need much care and can survive in the wilderness. Oddly enough, most people find it difficult to grow pasque flower in their garden. Pasque flowers are covered in fine silky soft hairs to insulate. As common as any other wild plant, you should not ingest this flower because it’s highly poisonous. Among those 30 purple flowers, which is your most favorite?